-From Sunday to Thursday you can reserve from 6h PM to 8h30 PM every 15 minutes! -Fridays and Saturdays we have 2 seatings, one at 5:30 PM and the second at 8h30 PM. -Don't miss our terrasse opened every day during the summer! -Tuesdays are closed during the winter. You can find a private parking on the streets of St-Laurent and St-Dominique between Sherbrooke and Pins! 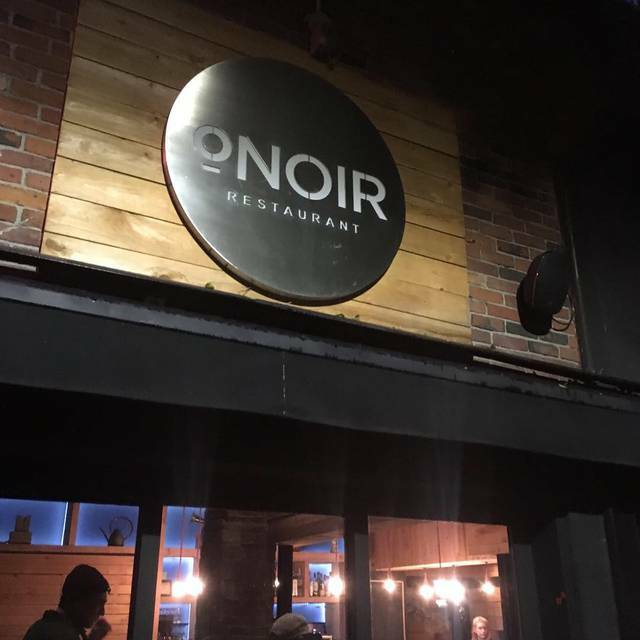 Onoir is the first restaurant in Canada that invites you to experience food, drinks and conversation like never before, IN THE DARK! Good food and a unique sensory experience. Modern decor in the ordering area, good menu and range of beverages. Would recommend to a friend, but can be confronting to eat in the darkness. It was excellent until a group came into the restaurant with a flashing light that kept going off. We were abruptly able to see each other and basically tanked the experience of eating in the dark. I think it was a child with flashing sneakers. Rude of parents to allow that and impact other people’s experience. Amazing experience, great service. Requires a bit of adjusting since you cannot see but really satisfying. I thoroughly enjoyed the evening! Wonderful staff, excellent food, a unique experience which I highly recommend! My only suggestion would be to add a fan (or something to circulate the air) in the dining room; it became uncomfortably warm with no air movement. The food was good but it’s really about the experience. We recommend doing it at least once. We chose the “surprise” menu. It was fun to try guessing what was served. While vacationing in Montreal for a long weekend, I surprised my boyfriend by taking him to Onoir. It ended up being our favorite part of the entire trip! We both chose the 3-course surprise menu with a surprise drink pairing at each course. Our server led us to our table and seated us with impressive ease, and described to us where our silverware, water glasses, etc. were located on the table. It is 100% pitch black inside the Dark Room, which was very disorienting at first, but also exciting-- it truly gives one a sense of what it might be like to be completely blind. It was a little bit noisy in the dining room, but not too bad. Some of the other diners were compensating for the absence of sight by speaking louder to one another, which I thought was kind of interesting. At each course, our server brought our food and drinks and placed them on the table with remarkable precision. The sensation of tasting food in the dark is one that I am eager to replicate – we enjoyed savoring each bite and trying to guess all of the flavors. The food itself was very tasty, and the portion sizes were perfect. If we ever get the chance, we would do this again in a heartbeat! My one small regret is that we never found out what our surprise meals actually were, so we’ll never know whether we were able to accurately guess the ingredients. I guess that means we’ll just have to try again! 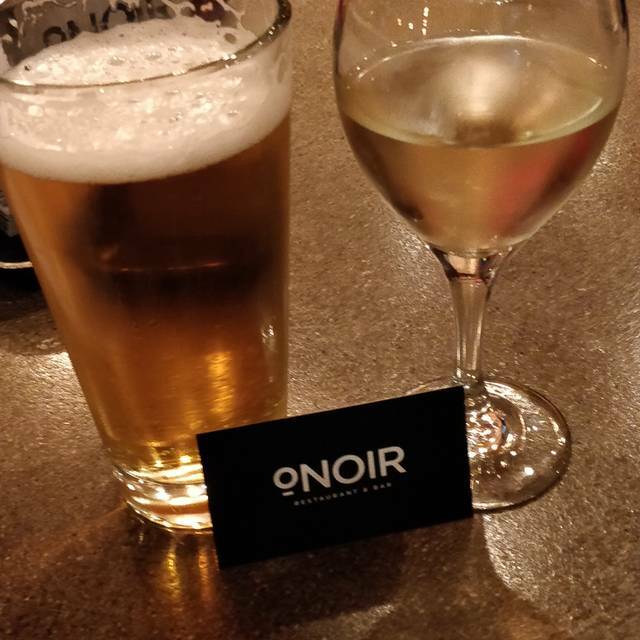 Our evening at ONoir was simply fabulous! The food was delicious. Our server, Sammy, gave us outstanding service. Dining in the dark was a really great experience for us. We will definitely return and recommend to our friends. I loved the experience ! Staff was really nice! Thank you!!! 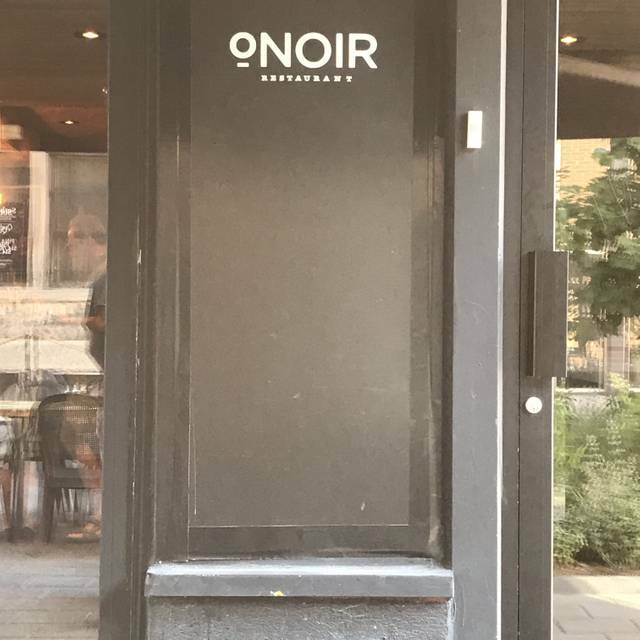 I was disappointed in this, my third experience at ONoir. The food was borderline inedible for all of us at the table. My pork osso bucco was severely overcooked, dry and crumbly. The mashed potatoes were completely flavorless. One person at my table received under cooked risotto, and the other received 3 under seasoned, huge slabs of tofu in a bland curry sauce. None of us were able to finish our meal. We were surprised to have been seated directly in front of the door, where light would periodically come in when the waitstaff went through. This definitely hindered our experience as we expected complete darkness throughout the meal. In addition to this, our chairs and bodies were continuously bumped by the waiters as they brushed by to go in and out of the dining room. My past experiences at ONoir are what brought me here for a third time, but I can definitely say I will not be going back, nor will I be recommending this to a friend. Nous avons adoré notre expérience. La nourriture était excellente, le service hors-pair et le prix avait bien de l'allure. Nous étions 4 et nous avons tous adoré notre soirée. On vous le recommande fortement. Everyone should experience this. The food is very good but is secondary to the venue - what it's like to "eat" without your eyes. There are several things you'll notice - each person will have a different experience. It will definitely make you "see" your world differently. Highly recommended! The experience was incredible - like nothing else. The risotto was colder than ideal, though I imagine this is to avoid risk of burning yourself in the dark. The beef fillet was very good. I had the surprise dessert and was blown away. Surprise wine pairings were also very well done. The service was exceptional. Aside from the temperature of the risotto, only real drawbacks were someone walking into my arm, causing me to spill on my lap (keep your elbows in!) and the noise level. In the dark, the very loud conversations all around us were quite overwhelming and caused a bit of anxiety. Overall, it was a great experience and a great bonding moment with friends. I would recommend others try it out, and be adventurous in your food choices! But avoid the risotto unless you like it luke warm. Very interesting experience. The food was delicious and the ambience was great! The waiter was very nice and guided us throughout the evening. I would have appreciated more varied options on the menu, but overall great experience! What an amazing experience! Sammy was wonderful and the Surprise food/cocktail/wine was delicious. Will definitely be back! everything was delightful aside from one customer who was entirely too loud and impacted our ability to enjoy our experience. The table next to us also commented on this issue. It was anxiety inducing and forced us to cut our visit short. Une expérience intéressante (dans le bon sens du terme). Nourriture divine. Overall, it was a fun and unique experience for my partner's birthday, and we both really enjoyed it. Completely unique! A couple of friends who've been told me they didn't like the food too much - we enjoyed it quite a bit overall (both vegetarians), especially the starter and desert - for the main dishes, they were tasty but one dish lacked proteins (a no-no in veggie cuisine) and the other had big slabs on tofu on it, which was good overall but it would have been easier to have small cubes, particularly in the dark. Cocktails and desert wine were good. The service was nice but it seemed like waiters/waitresses had many tables to service and were a little rushed; no-one took the time to explain, for instance, what the 'surprise dishes' were that we ate (I'm sure we could have asked, but I would have thought the explanation should come with the experience). So overall, it's good for a unique experience, definitely memorable, but I wouldn't go on a regular basis, bit pricey in that regard. Still, do check it out once! A very interesting experience, the food was lovely and service was fast and efficient! Definitely recommend it for something different. The drinks were a little pricey $10 for a glass of wine, but other than that it seemed good value for money as the food was superb. You got to try this once in your life. Scary at first since we are all used to the light but once you enter to the pitch black room all kind of emotion came to me and oh boy that is quite something. I order the suprise entree and meal and that added more fun to the whole experience. I got so much respect for the staff, they are amazing. Kuddos to the owner for creating this concept and to show my support I left a huge tip for all what they have done for the visually impaired community I recommend this to anyone who wants to try a restaurant out of the ordinary. I rarely give 5 stars but this one has earn it. We had an AMAZING experience. The waitstaff was so helpful and guided us to our table easily. My friend and I got the same meal, but she got a mystery wine and I got a mystery cocktail. Our food was delicious and our drinks complimented it perfectly! I am picky with drinks and usually like them to be really "yummy" so I just mentioned to the bartender that I wanted something fruity, and she made me a delicious drink. The dining experience of eating in the dark was so cool and we were surprised what we were able to do. It helped that the food was precut! 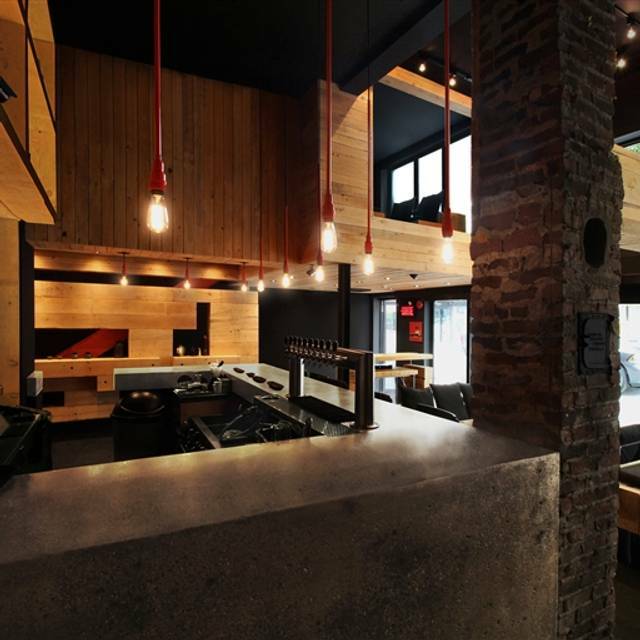 Overall this is one of my favorite restaurants in Montreal. It was a very intimate and intense experience. The servers were very informative and helpful in finding and altering menu options based on dietary restrictions. Our server Sami provided such amazing service and put us in a very comfortable spot as we were slightly anxious going in. Their vegan option was filled with flavours and even my partner who is a very picky eater was blown away with the curry. This experience well surpassed any of my expectations. Took our church youth group there for March break. Ages 14-17. 6 plus the leader. Had a great time and this gave them a chance to realize that maybe being blind is a super power as they all got to experience 2 hours of what a blind person would. They became aware of all their other senses immediately and throughout the meal. We all thoroughly enjoyed it. Absolutely incredible experience. Went with the surprise entree and dessert and it was superbly executed. Completely worth it for the atmosphere alone. Would completely do it again. I had an amazing experience and I’m sure that everyone I was with enjoyed it as well. I have a lot of respect for the staff, and love the whole concept of the restaurant. Well priced and very fun experience. Was a great time. Food was surprisingly great surprise is way to go. Sammie was delightful. We truly enjoyed it. O. 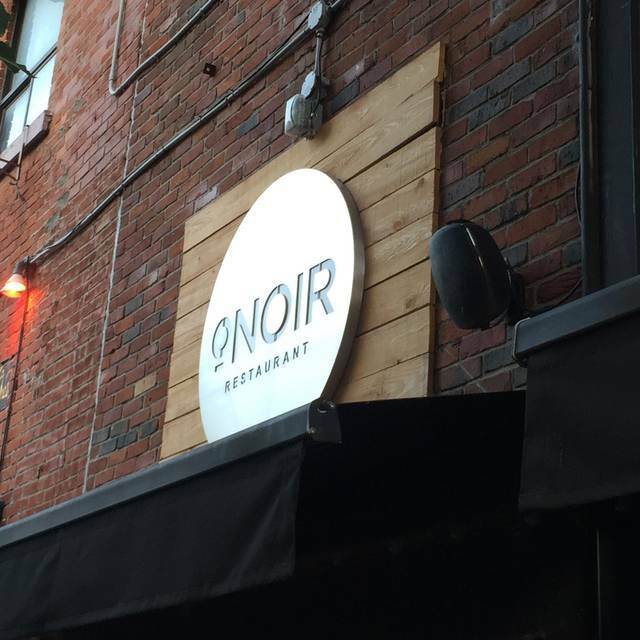 Noir is a wonderful place and an unforgettable experience! Very cool to try ones in a life time. Do not order anything what you have to cut. It’s hard to use the knife when you can’t see. Service was friendly and fast. very unique experience... ask for the surprise platter, it makes it even more interesting. Expérience tres surprenante. Rien d'exceptionnel dans l'assiette. Always a wonderful experience. Exciting and intimate, wonderful staff, delicious food. I love it. Very cool experience but may cause some anxiety if you're claustrophobic or not keen on being in total darkness. If you're up for a unique experience, definitely recommend, but just be aware of your limits when it comes to total darkness and dining. Revotons was dry and scallops were cold. Waiter was great (Sammi). Great experience and plan to bring friends to join us soon! What an amazing experience. I recommend ONoir to anyone!! Only regret was we didn’t get the “surprise” dishes. We had Sammy as our waiter and he was excellent! I had the surprise dish for my app and it was a duck dish which was the best dish I had in Montreal. The duck main and chocolate cake were great as well. Highly recommend and a very cool experience. My girlfriend and I really enjoyed the experience of eating in the dark, but we both found that the food was disappointing.